With the Packers in a bye week, Milwaukee took a week off from this list and New Orleans topped the NFL’s local market ratings for Sunday’s Saints-Colts game with a 46.6 household rating. 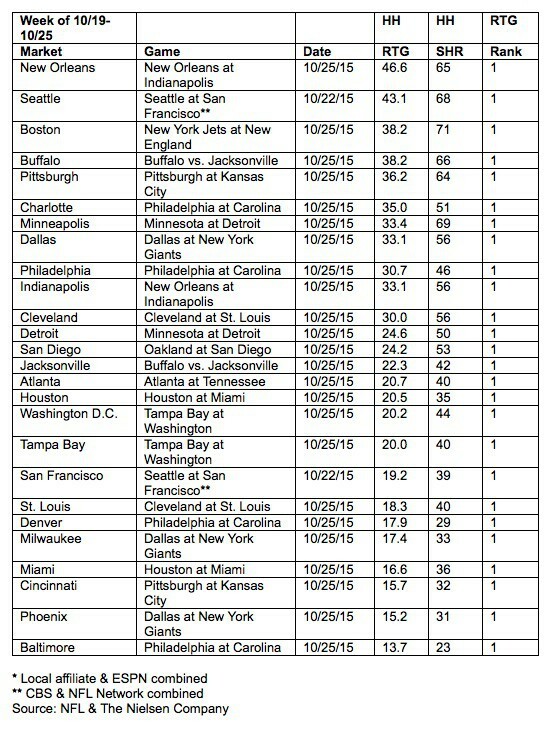 The streamed Bills-Jags game still aired on TV locally in Buffalo and Jacksonville and Buffalo ranked as 4th-best local market rating for the week for that game. Jacksonville ranked 14th. 46.6 % of the Mew Orleans market is around 295,000 homes. Here’s a list ranking the number of homes in each Nielsen market.